The Pacific Eden offers some amazing itineraries from our own backyard. 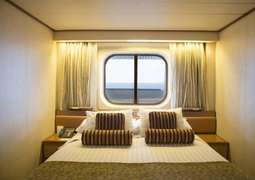 On board the P&O Eden cruise ship you can find a range of activities that will cater for your ever need weather you are on a family holiday or a relaxing trip. For families there are a lot of different activities that will keep your children occupied all day from play area for younger children to the Adventure Park on the top deck. While the children are playing and enjoying themselves, you can either relax in of the swimming pools and Jacuzzis or enjoy a day at the spa. In the evening you can enjoy a meal and have a wide range of cuisines like Asian and Italian or you can also have a meal prepared by celebrity chef Luke Mangan. All of this before the teenagers can avail of the disco or talent contest held in the HQ lounge and the adults can listen to live music in one of the Edens many bars like jazz, RnB and funk. There is a wide range of facilities on board the P&O Eden cruise ship that will make your holiday even more enjoyable! 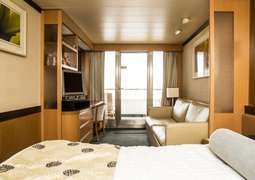 The accommodation on board the Pacific Eden is a blend of beautiful design and functionality. 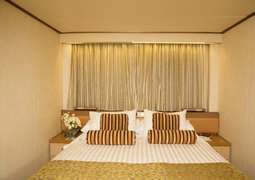 Inter-connecting rooms are perfect for families or groups and for a whole new level of luxury the Pacific Eden penthouse features a large spa bath, private balcony and large floor to ceiling windows for picturesque views of the amazing locations you cruise to. The Pantry is a new dining experience on board the Pacific Eden. A huge selection of food choices are available, the Curry House, Mexicana, Hook's Fish & Chips and Stix are just some of the many food choices available, all served in a freindly are enjoyable atmosphere. Experience upscale Italian dining in Angelo's, where classic Italian stylings and food are fused with a modern charm. Room service is available 24 hours a day. On the Pacific Eden fun for all is delivered throughout the day and evening! For the younger guests there are children’s centres. The premium cinema will show new movies and cult classics and a variety of spectacular theatrical shows are specifically designed for the entertainment of the passengers on board. In the night the variety of bars and lounges are sure to provide a place to enjoy the best of a cruise. From the chic Mix Bar to The Dome, the perfect spot if you are in the mood to dance the night away, you are sure to find the ideal spot to spend your time. Excitement can be found on board in the P&O Edge Adventure Park, the perfect place if you fancy a race down a zip line on the top deck of the ship or enjoying a lot more fun in Australia's largest adventure park at sea. 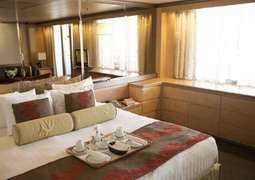 The atmosphere on board the Pacific Eden is casual and relaxed so it is recommended to wear clothing in which you feel comfortable. However for more formal occasions on board more smart attire is appropriate. The Pacific Eden offers some amazing itineraries from our own backyard. Search through the deals here on the page or call our cruise experts for the best options on all P&O Cruises. Call today on 1300 887 590.